East Coast (U.S.) earthquakes – What gives? On Tuesday afternoon, August 23, 2011, people up and down the United States’ East Coast–and as far inland as Chicago–felt an unmistakable tremor. At first, of course, the sensation was not so unmistakable: “earthquake” was not the first explanation that came to mind, especially for the explosion-conscious residents of New York and D.C. mere days before the 10th anniversary of the Sept 11 terrorist attacks, nor for Americans (and Canadians!) on the periphery of the quake’s perceptible shaking, where people were more likely to think they were simply nodding off to sleep or getting dizzy after a heavy lunch. For the tens of millions of people within hundreds of miles of the epicenter, however, this respectably sized M5.8 earthquake was quickly recognized for what it was, surprising as it may have been for many. Check out this post I compiled, which is chock full of videos from the quake. The quake immediately became big news nationally, and while East Coasters evacuated buildings, reeling in surprise and alarm, West Coasters took advantage of what they saw as ample opportunity to chide their uptight counterparts for not being laid back enough to deal with a measly 5. Some of it was rather snide. Let me remind West Coasters at this point that when a M5.5 hit Los Angeles in the summer of 2008, buckling subterranean water lines, breaking ceiling sprinkler pipes at LAX, and collapsing brick walls and chimneys throughout the region, the news coverage lasted for days. The startling “little ones” get ya every time. So don’t pretend you’re above it; it was a 5.8! 1) Why did an earthquake happen on the East Coast, away from the active plate boundary out west? 2) Why was this earthquake, apparently considered so puny by Californians, felt over such a great distance? and, as with most earthquakes 3) Will this happen again? i.e., Should we be worried? This generalized geologic map of the epicentral region was drafted by Chuck Bailey at the College of William and Mary, showing ancient tectonic structures in the bedrock that may be responsible for this year's tremor. Some of these questions have been thoroughly answered by articles and blog posts, but I think they’re worth revisiting for clarification. 1)Why did this happen on the East Coast? This first question is generically answered by the USGS as it is with every quake east of the rockies. Professor Callan Bentley, on the other hand, quite thoroughly explains the geologic and tectonic context of this earthquake on his blog Mountain Beltway. His post is well worth reading if you’re curious about how this quake happened or how others on the east coast might. The gist is that ancient faults that formed as the ancestral Appalachians were pushed up have been gently posthumously reactivated. They’re far from becoming prevalent active structures, but any imperfection in the crust is liable to slip a little given the right stresses. 2) Why was this earthquake felt so far? What does “Old and Cold” have to do with anything? Perhaps the most conspicuous feature of this anomalously noteworthy eastern quake was the radius over which is was felt. People thousands of miles apart were jostled from below all at once, by a meager 5.8 quake that wouldn’t grab attention for more than a couple hundred miles in California. Popular observation on this front has indeed identified a real phenomenon: earthquakes are felt for longer ranges on the East Coast, or to put it more technically, seismic waves attenuate more gradually there. For comparison, the Did-You-Feel-It map of the 5.8 Virginia quake is displayed at the SAME SCALE as that of a 6.0 in California in 2004. 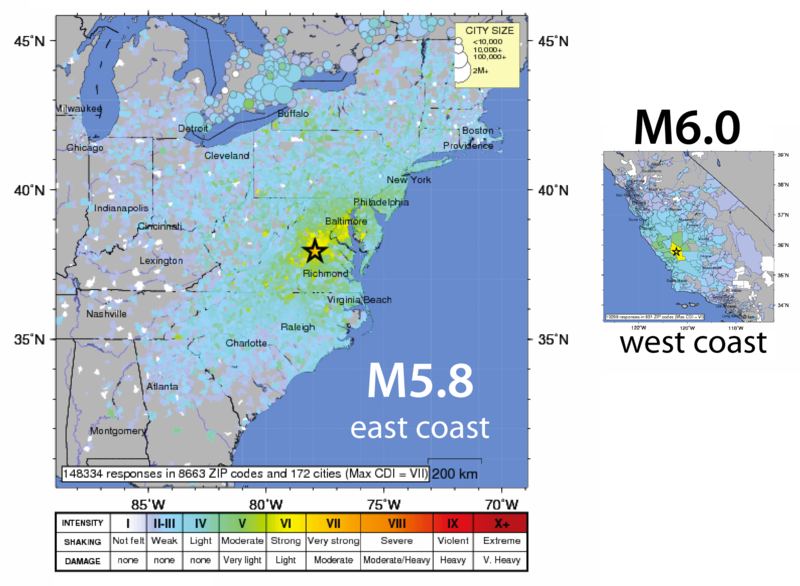 Note that the radius of perceptible shaking in the West Coast's 6.0 is basically the same as the radius of "moderate" shaking and "light" damage caused by a smaller quake on the East Coast. You have probably heard this phenomenon explained by describing the crust beneath the East Coast as “old and cold” (and by implication the western crust as young and hot, make of that what you will), but in all likelihood that was the extent of the explanation you got. The crust is older and colder so seismic waves travel farther. To me, this is only a partial answer. Age and temperature of the Earth’s crust are certainly correlated to how far seismic waves travel, but why so? What is the actual mechanism by which the age and temperature/density of the crust affect the passage of seismic waves? Did anybody else’s curiosity bells ring when they got this incomplete explanation? What does “old and cold” mean anyway? We consider the continental crust of the western U.S. to be “young” because it is actively (i.e., currently) deforming. As the Pacific and North American tectonic plates grind past (or into) each other, they drag and crumple one another. This generates cracks (faults), wrinkles (folds), and frictional heat, the manifestations of which are earthquakes, surface deformation, and generally warmer crust. On the other side of the continent, the crust hasn’t been beat up like that for hundreds of millions of years, so the faults and folds that formed even before dinosaurs roamed the continent have had plenty of time to seal shut with minerals and pressure. The heat generated during the formation of the ancestral Appalachian mountains has long since diffused away. Hence, it’s been a long time since anything substantially moved over there, and it’s been cooling the whole time: old and cold. Okay, but what does that have to do with seismic waves and how far earthquakes are felt? Based on the above, we know that the eastern crust is dense, solid, and intact. The western crust is riddled with faults and is warmer (meaning it’s less dense and more pliable). If you have something full of cracks, a force on one side of it will be much harder to transmit to the other side than a force on something solid. Imagine aluminum window blinds versus, say, an aluminum baking sheet. Ah, the old blinds-versus-cookie sheet comparison. Appropriately enough, aluminum is one of the most abundant elements in the Earth's crust! If you jostle the bottom of the blinds, the wave you create will make it some way towards the top before it dies out because energy is lost in the interface between each blind. If you apply the same action to a cookie sheet, the whole thing moves at once. Basically, this illustrates the difference between the fractured west coast and the coherent east coast. As one side of an active fault moves, the fault can slip so that the motion of one side is not transmitted across to the next, just like the blinds separated by strings. Any motion approaching faults is stunted because the interface doesn’t represent a solid connection. The same thing goes on at a microscopic scale within rocks. As a wave of deformation passes through a rock body, small imperfections in mineral grains can migrate, close, or slip, absorbing the incoming deformation. Imagine pushing on one end of a large sponge versus pushing on one end of a brick. The other side of the brick will move, whereas the sponge will absorb your force by deforming internally. The imperfections that allow this internal deformation are far more pervasive in the deforming, fractured west coast rock, so there are more of them to absorb the energy of seismic waves. Furthermore the migration, closure, and slip of these features is enabled by higher temperatures. High temperatures are the manifestation of energy stored within a material by vigorously vibrating atoms. The more vigorously atoms vibrate, the easier it is to knock them out of their position and into a new one. Thus, higher temperatures enable greater internal movement of atoms (deformation), which in turn can absorb the energy imparted by seismic waves the way a sponge absorbs your push on it by moving internally. This analogy is incomplete, since the continental crust of the western U.S. isn’t simply full of gaps and holes that can be compressed like a sponge. Internal shearing is prevalent, however, in a way that the weak sponge helps illustrate. Perhaps imagine the crust more like a hockey puck versus a stack of coasters. Push the top towards one side or shake the top back and forth, and whereas the whole puck will move coherently, the stack of coasters will lean over by sliding along each interface, thereby absorbing your push. So, as seismic waves ripple outward from an earthquake, their movement is dampened by every imperfection and every crack they cross, until finally they’re so small as to be imperceptible. This happens very quickly in actively deforming, broken up regions, but has a very limited effect in regions that lack serious discontinuities in the rock. 3) Should we be worried? One of the most important lessons highlighted by this earthquake is that anyone anywhere may be at risk of earthquakes. This is indeed a valuable thing to keep in mind, considering even approximately similar “repeats” of eastern North America’s historic earthquakes would be unbelievably devastating. Most people are vaguely familiar with these historic events (some huge earthquake in Missouri in 1811), but I encourage you to review all of these fascinating earthquakes through the USGS’s info pages about them. I’ll leave the full story of the New Madrid quakes for another post–they’re a remarkable series of quakes, and there’s been much contention regarding their magnitudes and their potential for repetition. For now, I’ll leave you to ponder the consequences of either of these–or anything like them–happening in this generation. There were several large earthquakes in the East that occured just after Europeans colonized it: 1663 in Quebec, 1638 in New Hampshire, several times in Massachusetts in the 1700s. Repeats of all of those could be quite devastating. Interesting to note the colonists were more aware of their shaky earth then most Easterners are today. And thank you for that note to West Coasters. Whittier Narrows in 1987 was M5.8, and it killed 7 people.